Recently, a fellow comic connoisseur and I were engaged in a friendly-ish debate, about which of our favorite team of heroes would win in a fight against one another. It’s a relevant discussion, with Marvel’s current series Avengers vs. X-Men making waves, though this wasn’t what sparked our dialog. No, this was simply me trying to educate someone who does not understand intricacies of superhero team dynamics. I mean really, how could anyone in their right mind think that the X-Men (his assertion) could possibly match the Legion of Superheroes (my stance) in a fight? Suffice to say, the whole episode sparked a list idea. Fortunately, our webmaster is a fanboy himself, and understood the burning importance this subject matter represents. One thing is for certain – there are A LOT of teams out there, but only the toughest made the cut. With the unsurpassed intellect of Reed Richards on your side, there are not too many situations that you can’t get out of. More to the point in terms of a head-to-head dogfight with other teams, Reed gives the Fantastic Four a tactical dimension that many other teams don’t possess. Sure, Captain America is a military tactician, but he’s not going to figure out the best way to deal with an opponent that might entail luring them into a trap that will maroon you in the negative zone or something. And when it comes to firepower, let’s not forget that Susan Richards isn’t a slouch by any means. Not only is she, hands-down, the most powerful member of the team, you can make an argument that she is one of the more powerful characters in comics, period. When you add in Ben Grimm’s strength that allows him to go toe-to-toe with Hulk-class foes, and Johnny Storm’s heat-based powers, you have the ingredients to be a contender. So while there are only four of these guys, they can still take opponents that are twice their size. The fact they have been together forever (they probably have the most stable roster of any team, save for the Elementals,) means that they work extremely well together, and we all know how important teamwork is for success. Yes, there are only four members of this team as well. That said, these are four VERY powerful heroes, and they almost always have to deal with numbers that exceed their own. They also have one very important thing in common: they’re all dead, having been resurrected by enormously powerful elemental spirits. Naturally, each was granted control over a respective element: Fathom got water, Morningstar got fire, Vortex got wind, and Monolith got earth. What’s more, they were all essentially granted immortality, as they do not age and can heal from any wound. And let me tell you, the Elementals did not have any problem whatsoever with dishing out violence, including death. These were not your ordinary heroes who were busy stopping bank robbers. They were, in fact, super-powered soldiers who were created specifically to battle an evil force that was threatening the universe. As such, fighting is what they do best. The very nature of their powers – from Monoliths super-strong Golem form, to Vortex’s devastating command of the wind – make them a very formidable team. I know, I know. These guys are a copy of the JLA – blah, blah, blah. I’ve heard the arguments, and I even agree with most of them. However, I still like the flawed nature that always seemed to permeate Squadron stories. Besides, these guys are still pretty damn powerful, and hard to deal with in a fight. Since these guys are pretty much a mirror image of the JLA, in terms of powers and capabilities, it should go without saying that they possess the ability to deal with a wide variety of threats. The only real drawback with these guys is that their personal drama, and sometimes-questionable ethics, tend to put a damper on their team cohesion. Remember, these are the guys that basically decided to take over their world for the betterment of mankind, which ultimately led to members leaving the team. But, as teams like the Avengers are well aware, when the Squadron has their act together, they can bring it with the best of them. Core Members: Captain Marvel, Mary Marvel, Captain Marvel, Jr. These guys are not strictly a team, and more of a family, as their name implies. Still, with the combined might of Captain Marvel, Mary Marvel and Captain Marvel Jr., you can’t ignore these people. True, there’s a ton of cheese, such as Lieutenant Marvels named Tall Marvel, Hill Marvel, and Fat Marvel, and a lot of the stories featuring the Big Red Cheese border on the ridiculous. Still, you’re dealing with 3 to 6 individuals with power levels close to Superman. When you bring all the Marvels together, even the silly ones with slightly less power, it’s would be like going up against a brightly colored pack of Kryptonians or Daxamites. And, because they don’t have any glaring weaknesses, the only way to beat them is to overpower them. How many teams could reasonably do that? I suggest not very many. These guys operate on the motto of “by any means necessary,” which should be a pretty good indication of how badass they are. Having started out as Stormwatch’s cover ops team, the original members understood the need to get the job done, outside of normal superhero protocol. The idea behind Stormwatch was to have a team in place that was powerful and capable enough to keep an eye on, and possibly take down, any superheroes gone rogue. The Authority is that and more. And it’s the team’s original roster that I would pit against any potential adversaries. Yes, their lineup has changed just like any other team. But in this case, the original is best. Just consider the line up: Jenny Sparks (electrical powers), Jack Hawksmoor (psychic bonding with cities), Swift (wings, sharp talons, strength and durability), Apollo (a Superman analog – including heat vision), Midnighter (a Batman analog, with the ability to foresee an opponent’s moves), The Engineer (able to create objects with implanted nanotechs) and The Doctor (magical powers of a whole bunch of ancestral shamans). This team has the attitude, the power, and the versatility to take on just about anybody. With a roster that is forever in flux, The Avengers are not exactly noteworthy when it comes to stability. Yet, with mainstays like Captain America around more often than not, the team is usually assured of sound field and tactical leadership. The current roster, though, has a nice range of power and capability. Featuring Cap, Iron Man, Hawkeye, Thor, Vision, Red Hulk, Spiderwoman, and Quake, this team can bring it. Thor and Red Hulk alone are a pretty strong combo. Plus, there is the experience factor. The majority of the members on this roster have been doing what they do for a while. These are not green rookies, who might not hold their own when the chips are down. Just the opposite in fact, which means that anyone who steps to these guys better have a damn good plan in place. Jim Lee’s current version of the JLA, for me, is the epitome of what you would expect from DC’s premier team of heroes. The current lineup, with the exception of Cyborg, is pretty much the same as the original lineup, which is a plus. With Superman, Wonder Woman, and Green Lantern, you have some of comic’s most outright powerful characters with these three alone. Once you add in Batman’s tactician and leadership skills, Flash’s speed, and Cyborg’s technological abilities, then you have a team that can take down all comers. Oh yeah, there’s Aquaman too. He can do…stuff. What I like about this particular incarnation, is that they have spent a considerable amount of time together without any roster changes. This means team cohesion, and plenty of time for Batman to whip these guys into shape as a coordinated fighting force. And remember when the JLA went up against the Avengers back in the day? Yes, it was a different roster, but that series gave a pretty good look at what the JLA is capable of against the competition. And while I am confining the team’s formability to the current roster, just like with the Avengers and X-Men, the JLA can call on a wide range of auxiliary personnel to help out in a pinch. Marvel’s band of merry mutants are a match for just about anyone they come into contact with. One reason for this is that there are so many of them. Even with all but 1% of mutants in the Marvel universe losing their powers, the X-Men still field a very large and diverse group of sub-teams. For the purposes of the list, I’m going with the current primary team, consisting of the roster that comprises Cyclop’s Extinction team. This group features Cyclops, Storm, Magneto, Emma Frost, Colossus, Danger, Prince Namor, Hope Summers, Magik, and Psylocke. Whew. Consider this: two of these members – Magneto and Namor – are KNOWN to have fought off whole teams of heroes on their own (the Fantastic Four, the X-Men, and the Avengers, just to name a few.) If one guy is able to fight a whole team by himself, and your team has two such members, then you’re probably good to go for awhile. Add in Hope’s ability to copy anyone’s power, Storm’s weather-based powers, as well as super-strength, mental-based powers, force beams, and holographic abilities of the remaining members, and you have a team that is positioned to do exactly what it sets out to do – protect mutants and present an intimidating force. Plus, this team can call on any number of semi-independent X-Men teams for assistance. This would include Wolverine’s team as well, in a pinch. All of these guys train heavily to master their powers, and work together as a fighting force. This is what they do, and they do it better than almost anyone else. True, the Imperial Guard is not – by strict definition – a superhero team. Rather they are a collection of super-powered agents of the Shi’ar Empire, whose main mission is to safeguard the realm, enforce the law and order, and protect the royal crown. So, close enough. The Guard is another Marvel grouping that essentially pays homage to a DC creation, namely the Legion of Superheroes. As such, the Guard has a pretty big roster, considering they have to concern themselves with the protection of an empire that stretches across a good portion of the galaxy. Over time, roughly 65 members of the Guard have made an appearance. However, the original incarnation only had 15: Gladiator, Electron, Oracle, Mentor, Fang, Starbolt, Scintilla, Titan, Astra, Smasher, Nightshade, Magic, Pular, Hobgoblin and Tempest. Using this version as my base, we see a roster that not only has a wide array of powers to bring to bear in a conflict, but also can cause a helluva lot of damage. These guys do everything from shape-shift, to telepathy, to conjuring magic. Gladiator is the primary Guardsman and the most powerful, having gone toe-to-toe with the likes of Thor and Black Bolt, so you know he’s the real deal. In fact, the Guard has taken down the X-Men, the Inhumans, and pretty much anybody else they have run up against. Because of their numbers (again, there’s a whole lot of them) and the capabilities they bring to the table – there’s really only one team that could reasonably stop these guys. This would be that team. The Legion is the premier group of heroes from the far flung distant future of the DC Universe (the 30th Century, to be exact). The group, unfortunately, has endured all kinds of reboots. Fortunately, they finally seem to have gotten it right in the current incarnation, which is basically the original group back as it was pre-Crisis. Legion by-laws cap their roster at 25 members, and the group generally maintains a membership that is close to that number. If nothing else, their sheer numbers provide a powerful punch that few other teams can replicate with standing lineups. It is the current lineup that we are using for this list. The roster features heavy hitters like Mon-el and Ultra-Boy, and provides versatility with characters like 12th level genius Brainiac 5, and precognitive Dream Girl. The Legion has the legs to confront any foe on its own terms, and a wealth of capabilities to overcome any circumstance (the last incarnation of the JLA can attest to this.) They have all the bases covered – heavy hitters, ferocious fighters, mentalists, energy manipulators, teleporters, martial artists, and shape-shifters. When the smoke clears, there’s no doubt that the Legion is going to be the team left standing. Fun article to read. I may disagree about the order but that would be a minor quibble. The Shi’ar Imperial Guard was a surprise to see on this list, however. I view them as a military team and part of the system that maintains political power (military-industrial complex). The Kree, Skrulls and even the earth-based Sentinels would fall into this category. Good synopsis of each team as I can see it was written by a fan of the genre. This must have been fun to research and write. The only team I can think of that belongs on this list would be The Defenders. With an original roster of Dr. Strange, Silver Surfer, The Hulk and Namor they certainly deserve an honorable mention. I personally would rate them with the higher echelon teams comprising The JLA, Avengers, X-Men and The Legion. I also liked what I read about both The Elementals and Squadron Supreme – two teams I’m not that familiar with. I only know Squadron Supreme through the Crossover ‘Ultimate Power’ and they seemed pretty interesting in that arc. Am I the only one who doesn’t see the legion in the number one position? Defenders is a good add. Teen Titans and the Watchmen should get a nod as well. Goku and Crew are the strongest. Hmmm…I didn’t even think about the anime stuff – yeah, in their own right, they are a fairly powerful bunch. I would put the avengers on top 1, and the fantastic four higher. I would like to have seen The Defenders, Watchmen, AND The Inhumans… They’re nothing to sneeze at either… Consider the Watchmen’s Dr. Manhattan and Ozymandias… Both are scientists And Geniuses… their roster includes Silk Spectre II, and Nite Owl II… There’s The Defenders: Doctor Strange, Demonslayer, Gargoyle, The Hulk(Green) The Silver Surfer, and The Submariner. Not to mention Hellcat, and Son Of Satan. The team that should be #1 isn’t even on the list- The Green Lantern Corps, if for no reason other than sheer numbers. Ok – I was thinking the same thing. I even consulted with the toptenz master about it (he’s a comics fan as well). For the purposes of this list (and i know, you could make the same point about the Imperial Guard) I wanted to keep to organizations that have a “team” concept. I agree though – their sheer numbers and power they bring to the table is enough to have them rated. Number 1 spot is surely The Green Lantern Corps??? I third this notion. GLC all the way! The author and I considered this, but felt the GL Corps was more like a small army (brigade or division – http://en.wikipedia.org/wiki/Military_unit#Commands.2C_formations.2C_and_units) rather than a team. But otherwise you are right, they could possibly be the most formidable “team” out there. Actually Green Lantern Corps should be regarded as a superhero team. Most powerful weapon, large number of member , they have even a planet (Mago). If you count Shi’ar Imperial Guard , then GLC shouldn’t be a problem . How can Extinction Team is stronger than JLA and Avengers ? cool list thanks, there’s a typo on the LOSH part “Lightening Lad” instead of “Lightning Lad”. Ooops I made a mistake 🙂 thank you for correcting. I totally agree with you , JSA should be in the list. 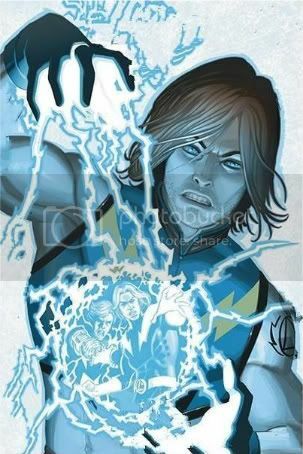 Lightening Lad is now Lightning Lad. And we present a cool picture of him just to say we are sorry. And here is his very plausible origin: a lightning monster, of course. I seriously considered the JSA – personally, they are one of my favorite teams (its interesting what DC is doing with its Earth 2 series and some of these characters – the jury is out if its going to work or not). Anyway, I wanted to get a nice cross section of teams on this list and not be overly DC or Marvel heavy. How about the Gauls? The village powered with magic potion is surely incredible. Surprised not to see the Watchmen on this list and very surprised to see the LoS. Was never all that impressed with them. Was also pleasantly surprised to see the Shi’ar Imperial Guard. The Shi’ar Guard is based on the Legion. If you’re pleasantly surprised you should consider the Legion entirely above them. They have Superboyx4 on their team. Hmmm…I just read this list – edited fairly heavily. Not in a bad way, just in a noticeable way. Though that might be more like an insane following rather then an actually team. No JSA – Dr Fate? Jakeem Thunder? Spectre? Hello, is there anybody in there? If they want to include the Imperial Guard, then yeah, you need to include the Green Lantern Corps and probably the Captain Britain Corps. No Defenders? No Infinity Watch? This list is amateur at best.